Selection of the must to do thing in Cortona. There are some attractions that no visitor should miss, below, we’ve put together 10 of the best, all of which you can see within one or two days. 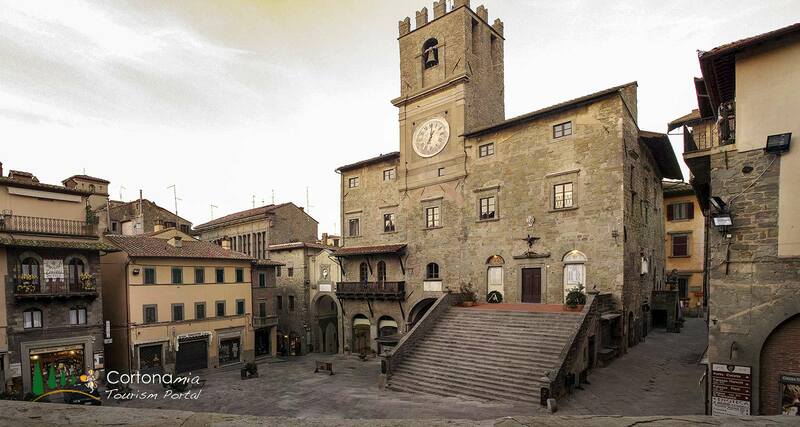 Piazza della Repubblica: Cortona, built on the slopes of the hill and still surrounded by well-preserved walls, lies the Piazza della Repúbblica, on the east side of which is the Palazzo del Popolo (14th century, rebuilt 1514 onwards). Palazzo Comunale: The west side of the square is dominated by the imposing Palazzo Comunale, which was already in existence in 1241; it was rebuilt in 1275, enlarged in the 16th century and rather clumsily restored in 1896. The front of the palazzo is given its characteristic aspect by the battlemented clock-tower (1509) and the flight of steps (also 16th century) leading up to it. Praetorian Palace: To the northwest of the Town Hall in Cortona is the Piazza Signorelli, with the Palazzo Pretorio, the facade of which bears the coats of arms of former podestàs; it now houses the Accademia Etrusca (founded 1726) and the Museum of Etruscan Antiquities (Etruscan bronze candelabrum; fifth century B.C.). Piazza Garibaldi: From this square where at is center is collocate the obelisk dedicated to Giuseppe Garibaldi, is possible to get a wide view of the Val di Chiana to Lake Trasimeno and Montepulciano. Stop here to enjoy this breathtaking panorama. 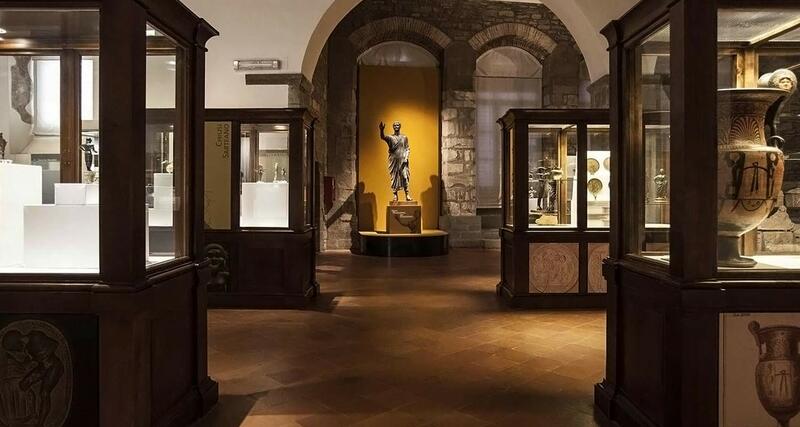 Cortona’s civic museum at Piazza Signorelli offers a fascinating and eclectic collection that goes beyond the Etruscan limits suggested by its name. The Accademia, a historical institute founded in 1727, numbered Voltaire among its early members. The museum MAEC occupies one of the town’s more impressive medieval palaces, the 13th-century Palazzo Casali (or Palazzo Pretorio), former home to Cortona’s leading medieval family. The main hall contains a famous and unusual 5th-century bc chandelier. The largest object of its kind ever found, it consists of a gorgon’s head surrounded by dolphins and stylized waves, its 16 small oil lamps formed by alternating male and female figurines. Attic vases, bronze figures, and Roman statuettes line the walls, together with paintings by Pietro da Cortona and Luca Signorelli, both natives of Cortona (as well as works by Pinturicchio, Cristofano Allori, and more minor artists). Rooms off the hall include further paintings, notably a triptych by Bicci di Lorenzo, as well as (poorly labeled) fans, ivories, weapons, porcelain, miniatures, coins, and jewelry. Best of this miscellany are several medieval ceramics and an Egyptian collection amassed in 1891 by the Vatican’s Egyptian legate. Open: daily, 10-1 and 4-7; winter, 9-1 and 3-5; closed Monday. Admission charge (moderate). The museum is a rather gloomy former church whose interior is enlivened by a small but prestigious collection of Renaissance paintings. Perversely, however, it opens with a 2nd-century Roman sarcophagus, whose carved centaurs and battle scenes were apparently much admired by Donatello and Brunelleschi. The fresco fragments here include The Way to Calvary by the Sienese master, Pietro Lorenzetti. 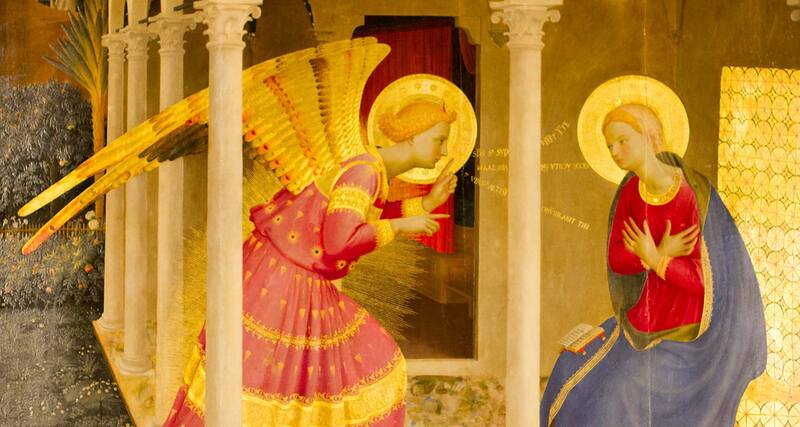 Two paintings by Fra Angelico dominate the gallery propera sublime Annunciation (1428-30) and a triptych of the Madonna and Child with Saints. Both were painted during the artist’s 10-year sojourn in Cortona’s Dominican monastery (the triptych’s predella depicts scenes from the life of St. Dominic). The room also contains three works that would be outstanding in any other company: a Crucifix by Pietro Lorenzetti; Sassetta’s Madonna and Child; and Bartolomeo della Gatta’s Assumption of the Virgin. Lorenzetti has another beautiful painting in the room beyond, a Madonna Enthroned. Local painter Luca Signorelli is also well represented by a Deposition and Communion of the Apostles. 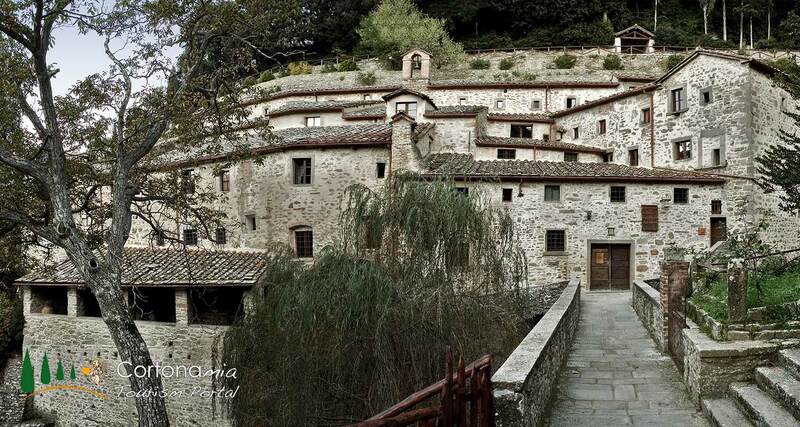 The Monastery of Celle is a sacred building located in a village “Le Celle”, 10 minutes from Cortona. 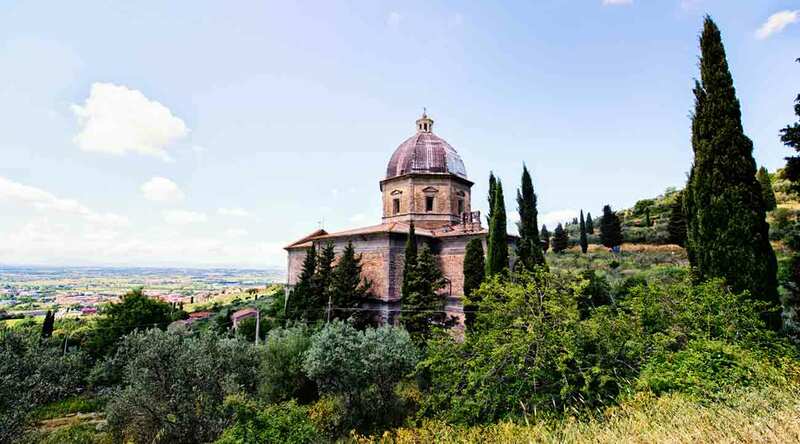 The monastery of Celle of Cortona, built at the turn of a narrow valley, is very suggestive for the spirituality of the place: from here you can also enjoy a splendid view over the Valdichiana (Chiana Valley). The convent of The Celle is the first monastery built by St. Francesco of Assisi around 1211 and was inhabited by him even after receiving the stigmata. Here probably dictated in 1226, just a few months before his death, his Testament. Even today you can visit his cell with some objects used by St. Francesco and the oratory of his first mates. Today, the monastery of Celle of Cortona is inhabited by a brotherhood of seven Friars who are still in time inherited the experience of prayer by St. Francesco. Probable Etruscan origins was a post used by the Goths first and later by the Lombards at the time of the Barbarian invasions. Yet, news about it dates to 1258, only, thanks to an act of conveyance of the complex bought by Arezzo.In the years, it underwent numerous alterations and restructuring that started in 1266 and continued in the XVI century as established by the Casali who were the lords of Cortona for all the XIV century. The Sienese carried out a further reinforcement work when they were allied with the inhabitants of Cortona in the battle against Arezzo and the local Guelfs. Yet, the Florentines, who owned the fortress since 1411, performed the most important structure that gave the fortalice its current architectural appearance. In the XV century, the central body of the fortress was carried out and also Cosimo I de’ Medici worked on it at the half of the XVI century. After a long inspection on all the fortresses that had recently come into the possession of Florence, the Grand Duke was astonished by the peculiar position of the Cortona’s stronghold. Thus, he decided to transform it into one of the most imposing bulwarks of the Medicean power in the territory of Arezzo. Even if Florentine money financed this work, started in 1556, the local population strongly contributed to it since they were submitted to heavy taxation. The new castle showed a trapezoidal perimeter of walls surrounding it and four huge bastions dedicated to St. Margherita (in effect, the church titled to her, who is Cortona’s patron saint, rises at a short distance), Santa Maria Nuova, St. Egidio and St. Giusto. The post of the garrison, the powder magazine and the prison are on the inside. Moreover, the walls were built with cutting-edge methods with a terreplein at their foot planned to soften the gunshots. The town immediately benefited from the new restructuring that allowed it to defend from the pressure of the Sienese and of the State of the Church, having its borders not far from Cortona’s. the new atmosphere of peace and stability that started in the XVII century, the Grand Dukes’ interest in military constructions began to weaken to the benefit of luxury residential palaces and the stronghold progressively started to lose its importance. Therefore, the Fortress of the Girifalco became the base of a small garrison that acted as a town police, only. The shrine is dedicated to the figure of Santa Margherita, patron of Cortona and Franciscan tertiary, and subsequent cultural and spiritual activities of the Observant Franciscans. On the death of the saint (February 22, 1297) it was decided to build a church in her honor, next to the ancient church of St. Basil that Margaret herself had restored after it is chosen as the place of penance and prayer. In 1304 the sacred building was already built, but it continued to embellish it with important frescoes throughout the fourteenth century. This cycle mural have come to us only a few fragments preserved in the Diocesan Museum, but examples preserved in a code of the seventeenth century that documents with twenty scenes watercolor murals lost in 1653 when, because of their poor condition, were whitewashed. The analysis of the surviving fragments leads to date them around 1335 and to attribute them to the workshop of one or both of the brothers Lorenzetti. In 1385 the church was entrusted to the monks Olivetani, replaced in 1389 by Minor who still have care and welcome visitors. In August 1927 he was elevated to the rank of minor basilica. 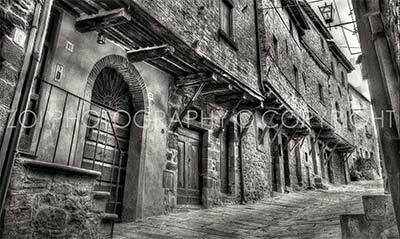 The Archaeological park of Sodo is located at the bottom of the hill of Cortona about 4 km. 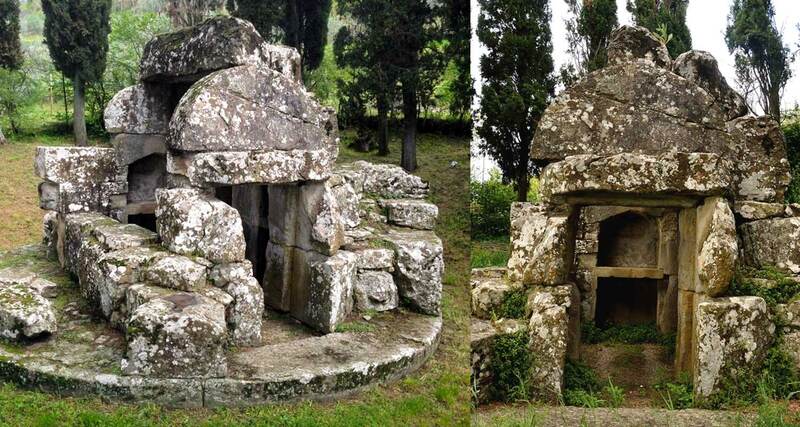 Situated on the right bank of the Rio Loreto, the Melone tumulus consists in an artificial mound and is an example of archaic Etruscan funerary architecture. The burial site was investigated and unearthed during an excavation campaign carried out in 1909. The tomb consists of a long uncovered dromos (entry-corridor) leading to a five-chamber area consisting in turn of one central chamber and four chambers opening onto the central corridor. The tomb features a pseudo overhanging vault. Recent excavations (2003) brought to light part of the original socle. The Melone II of Sodo is located on the right bank of the Rio di Loreto. This burial site too may be dated back to the archaic period and consists of two separate inner tombs: the Tomb I featuring a pseudo-vault roofing was unearthed in 1928/9; the Tomb II was discovered in 1991 and contained a real wealth of golden grave goods. In 1990 excavations brought to light on the east side of the of the mound perimeter a monumental altar-platform accessed by means of a stairway whose side-walls are decorated with reliefs and sculptural groups. Entering on the Sanctuary of Santa Maria delle Grazie, it affects the sense of emptiness full of presence. The Church is essential in its construction and it is beautiful because it is essential, and any enrichment Baroque offends. Its architecture is a clear geometric scanning, it is made up of lines and arcs that intersect each other, white and gray alternating, niches, overhangs, frames, wheels, all marked by sobriety, linearity (the style of Brunelleschi) to give the sense of sacredness that is when we are at the “Presence”. The effort expressed by the artist is precisely due to the attempt to achieve a place in everyday life and work, a temple dedicated to the Presence. The artist has managed, through its architecture, majestic outside and essential inside, and through space and light, to give to anyone entering the Sanctuary the sense of being immersed in the sacred, conducted in front of the reality of God that fills the his house, his place of sacredness and immensity. The work reflects the power of the genius of the artist for his grandeur, while the interior is linear and bare. It contains within itself all the main features of Renaissance art and architecture: the geometric perspective that organizes space, simplicity, geometric lines. The structure of the church consists of a nave flanked by two side chapels with a transept and a dome at the intersection of the equal arms of the presbytery. Martini designed it strictly applying architectural principles of proportion and perspective dear to Renaissance architecture. Spaces resonate the Alberti echoes, in a project that is not immune to similarities with Brunelleschi, but the designs of Francesco di Giorgio are absolutely original, to the point of being one of the highest levels of the synthesis of the spaces in the Renaissance. The church of Santa Maria Nuova is located just outside of the walls of the town of Cortona. The church was built to house a miraculous image of the virgin that previously had been in a private chapel. Construction was begun in 1550, and the church was consecrated in 1610. The original church design is attributed to Giorgio Vasari, and modified by Battista Cristoforo Fanelli. Nestled half-way up and against a hillside, the ground plan is a square, and the church is surmounted by a dome with a lantern, completed in 1600. The high altar was completed Cortonese artist Bernardino Radi. The altarpiece to the right of the entrance holds an altarpiece by Alessandro Allori, depicting the Birth of the Virgin Mary (16th century). The Rosette window on the facade was designed by Urbano Urbani (16th century) and depicts an Adoration of the Magi. 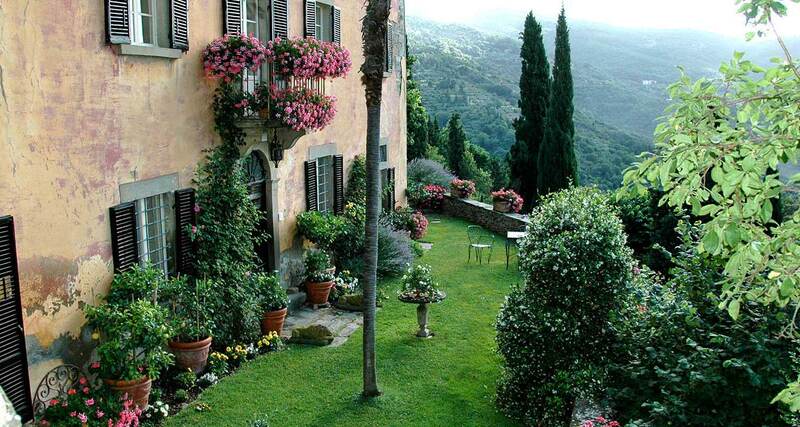 An American writer buy and restructures a villa in the Tuscany above Cortona town in Tuscany, and there began to spend summers. The scenery is lovely, the mild climate, the food delicious. And by the charms of an ideal life, marked by the rituals of the campaign, was born the memoir, that has enthralled America for the beauty of the environment, but also for the quality of the writing that describes, evocative, intense, capable of forward with evidence almost tangible enjoyment of life between the colors, the smells, the flavors, recipes and suggestions collected by the author, an Italy to discover or rediscover. Today the villa is a destination for thousands of tourists especially foreigners from all over the world who come to visit to savor the atmosphere of the famed best selling book “Under the Tuscan Sun” (Under the Tuscan Sun)The villa can be reach by foot with a nice walk starting from the public gardens in Cortona “Parterre” about half an hour on foot for a distance of about 4 Km. Descending the hill of Cortona among the olive groves a rare beauty you can visit, the Tanella of Pythagoras a famous monument known to travelers since 1500, the Tanella is a small mound of the Hellenistic period (II if BC.) Consists of a circular base on which you set another drum with blocks juxtaposed. The interior has a short dromos and a small rectangular room covered by a barrel vault. The first news that we have on it is attributable to a visit by G. Vasari in 1566 that looks like the judge the tomb of Archimedes. Since then, visitors have indulged in the building who in recognizing the tomb of Ulysses, the other that of Pythagoras, recalled at the awards greek–style of Hellenistic architecture. The monument underwent progressive deterioration from five nineteenth century, when French troops passing through they have caused a considerable damage. The most recent criticism puts its dating to the second century. C. It was donated to the Accademia Etrusca in 1929 by Mrs. Mary Laparelli Pitti. . The Tanella can be reached by car or by hiking trails. There is no parking, and parking on the road side is illegal, please considering to visit the Tanella going by walk.